As a regular reader of my blog (with its less than regular posts), you’ll know that I started running in 2009. Over 3 years later and I’m still running. In fact, in February, I recorded 97 miles which is my highest mileage month ever. There is one reason I’ve kept running and that same reason has changed my life, probably forever. That reason is parkrun. Back in May 2010, I ran in my first parkrun in Eastleigh’s 3rd event. Since then I have run 1000s of miles and transformed my life both in terms of my fitness but also my social life. Without parkrun, it’s highly probable that I’d have given up on running a couple of years ago and returned to life where exercise played little part and I rarely left the house. parkrun has given me a weekly opportunity to get out and run fast (until recently) and that’s led me to continue mid-week training to get faster. It’s given me the opportunity to meet lots of people and make new friends. It’s also provided me ample opportunity to organise the events (as Run Director, Event Director and, most recently, as a parkrun Ambassador), speak at local council-run conferences and networking events etc. One thing that prior to late 2012 it hadn’t given me was the opportunity to run that often at the event. However, Daniel’s desire to take part in parkrun changed that. We are now able to run almost every week. 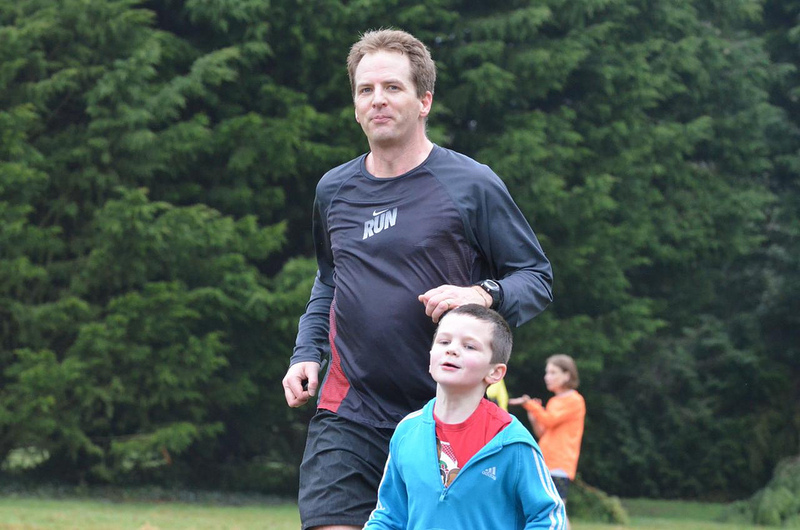 It’s been great to be able to share my Saturday mornings with Daniel at parkrun. It’s bought us even closer together and, although it’s a challenge for him, he’s really enjoying it and loves the attention he gets. 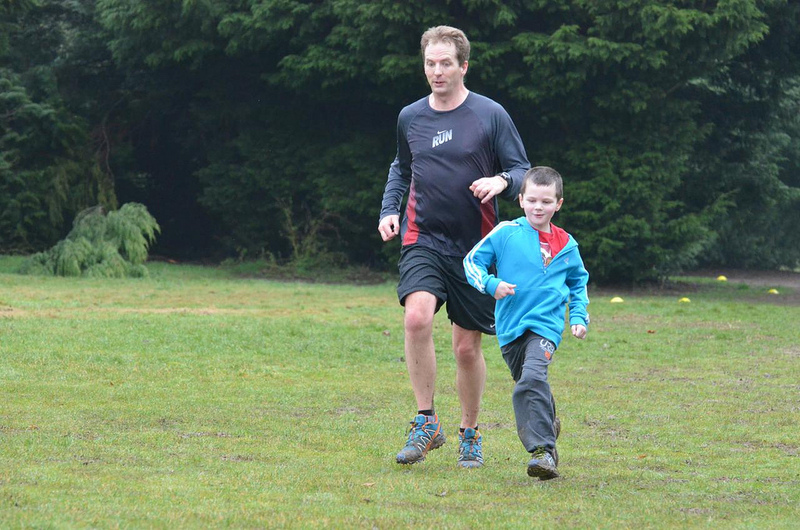 So, after 34 months, yesterday morning, we headed to Fleming Park to complete my 50th parkrun and Daniel’s 10th. It was a little touch-and-go as to whether we’d make it due to my work commitments the day before Mother’s Day. In fact, I was busy trying to help rectify an issue until moments before we left the house. We chose Eastleigh parkrun as the venue as it’s got a great community and it’s quite small and therefore you can feel part of it more easily than an event such as Southampton with its 350+ runners. It’s also Daniel’s favourite course. Next week, it’s Netley Abbey’s anniversary so we’ll be there for that. The rain 24 hours preceding the event meant the course was muddy, slippy and wet again after the previous weekend’s relative dryness. It was great to see lots of familiar and friendly faces and enjoy our T-shirt runs with Paul Kemp (running his 100th parkrun) and Becky Cleeves who was running her 50th. As we ran around the 3-lap course, Daniel got lots of encouragement (a real benefit of a multi-lap course) from marshals and other runners. It seems that each week more and more people know him and he’s slowly coming out of his shell and getting to know them. Daniel made a real effort to run as much of the course as he could and, in fact, other than walking up the hill and a couple of 10 second walk breaks he ran the rest. That approach was rewarded by a 90+ second parkrun PB which was great given the far less than perfect conditions. As we ran around, I was having to keep in touch with work via email which was a bit of a pain but at least it meant we could be there. When we crossed the finish line, Keith Whitaker pulled some poppers and we eat some of Saffy Cleeves’ delicious cake. Thanks Saffy!! We then had to rush back home and on the journey home, I had a call to inform me of an urgent issue at work that needed my attention. It was great to be able to complete my 50th run. At times, it felt like I’d never reach the milestone what with volunteering at many early events once I became Run Director then Event Director. As I said earlier, parkrun has changed my life and I hope my contribution has helped other’s change their lives too. The countless hours both at events and behind-the-scenes over the last 2.5 to 3 years has seen many, many others be rewarded with their 50 T-shirt before me and I’ve been proud to have helped organise and stage the events to allow that. My life within parkrun has changed. I’ve recently passed on the Event Director role for both Southampton and Netley Abbey to allow me to become a ‘parkrun Ambassador’. Currently, I’m one of a select handful and our responsibility is to help support existing events as well as activate new events. These are roles I’ve done informally for quite a while anyway but the role solidifies my involvement within the parkrun organisation. Although I have a lesser role at the 3 local events, I am still very active behind the scenes with both supporting those events on a day-to-day basis but also currently being in various stages of helping bring 4 new parkruns to life (aka event activation). These are Winchester, Brockenhurst, Petersfield and Portsmouth. Activation involves a fair amount of work including helping to build the local event teams, helping to secure funding from local councils, deciding on the course, training the teams and supporting them to the journey to their inaugural event and beyond. I’m passionate about parkrun and how it can change lives and help develop strong communities and will do all I can to help parkrun spread into other communities. I can’t wait to be able to wear my 50 T-shirt and to see Daniel receive and wear his. Although I have had lots of involvement with parkrun to date, I won’t feel as if I’m a true parkrunner until I have my T-shirt on.